Watch The OGs on The TODAY Show on Tuesday! Get to know the OGs a little better by watching them on NBC’s TODAY Show, airing Tuesday, July 6, probably around 8:50am. If you miss the airing, our segment will also be online on the TODAY Show website, and we’ll share that link when it’s up. 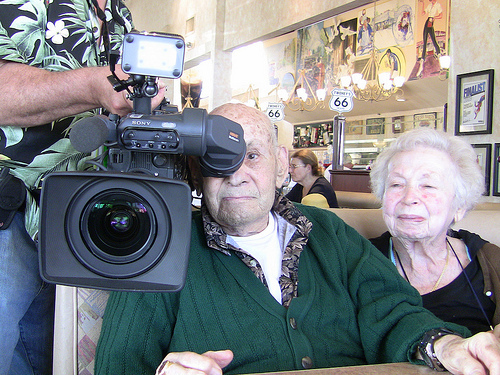 Above: Pop Pop takes a peek through Sandy Spooner’s camera during a break from the TODAY Show filming of the OGs’ hot fudge sundae date at Twohey’s. I love this. It is so wonderful to see two people still acting like teenagers. Your story on the Today Show was very insperational for me. I hope when I am married, I will have the many great years you have been blessed with!